Cosmologists are always complaining about their inability to find the dark matter in the universe, invisible stuff that's supposedly more prevalent than regular matter. They don't even know what it is, so of course they can't see it. Meantime, a whole bunch of normal matter is missing, too. A new computer model at least suggests where some of that missing normal matter might be. Regular matter - the "visible" atoms and molecules of dirt, people, stars, gas and dust - makes up only about 5 percent of the universe. Scientists call it baryonic matter, or baryons. Dark matter is the term used to describe the invisible stuff that's holding galaxies together. Some 25 percent of the universe is dark matter, and it's all missing in action. The rest is even more mysterious, a sort of anti-gravity force called dark energy. While scientists have no clue when they'll actually find dark matter, they'd really like to square the cosmic ledger a bit by tallying up all the regular matter that theory holds should exist. Only about 40 percent of it is in the books yet. 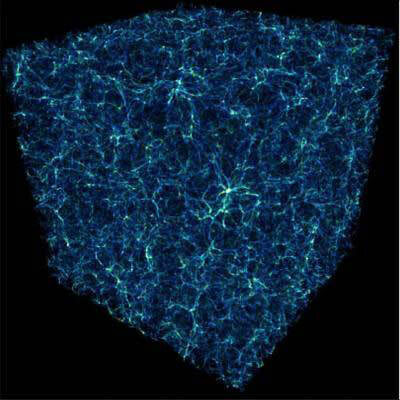 The rest, according to the new simulation, is gas that's caught in a tangled web of cosmic filaments that are hundreds of millions of light-years long. The filaments connect clusters of galaxies, and the gas within the filaments is hidden by huge gas clouds. This conclusion is based on a new computer model that took nearly 10 years to make. It models a region of space equal to 2.5 percent of the visible universe and showed how matter collapsed due to gravity and became dense enough to form the cosmic filaments, galaxy structures and the clouds that hide the filaments. "We see this as a real breakthrough in terms of technology and in scientific advancement," said Jack Burns of the University of Colorado at Boulder. "We believe this effort brings us a significant step closer to understanding the fundamental constituents of the universe." The research will be detailed in the Dec. 10 issue of the Astrophysical Journal. Burns predicts that future telescopes will be able to spot the filaments. The 10-meter South Pole Telescope in Antarctica and the 25-meter Cornell-Caltech Atacama Telescope, or CCAT, being built in Chile's Atacama Desert, will aim to do so, Burns said. The CCAT telescope will observe radiation in sub-millimeter wavelengths, which are longer than infrared waves but shorter than radio waves. It will probe galaxies in their infancy shortly after the universe was born. "We think that as we begin to see these filaments and understand their nature, we will learn more about the missing baryons in the universe," Burns said. This conclusion is based on a new computer model that took nearly 10 years to make. It models a region of space equal to 2.5 percent of the visible universe and showed how matter collapsed due to gravity and became dense enough to form the cosmic filaments, galaxy structures and the clouds that hide the filaments. The 10-meter South Pole Telescope in Antarctica and the 25-meter Cornell-Caltech Atacama Telescope, or CCAT, being built in Chile's Atacama Desert, will aim to do so, Jack Burns said.